This long range telephoto camera was used by the KGB to take photos of people going in and out of American Embassies in the 1950's, 1960's and 1970's. 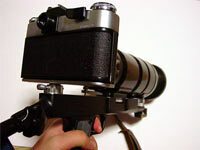 It was called the Photosniper because of the stock on the camera which could be pointed like a rifle. After the collapse of the USSR, these units were imported to the USA for a time. They are now hard to find. Take a look at the specs. The Long Range Surveillance Telephoto Camera Set comprises a high quality Zenit-122S SLR camera with Super-3S telephoto lens, MC Helios-44M-6 interchangeable lens and accessories. This is a legendary sniper camera, originally developed for Soviet KGB surveillance operatives. 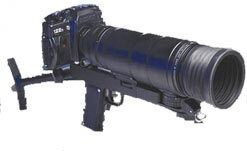 It's a unique configuration of a 35mm camera with a powerful 300mm telephoto lens and an ingenious integrated stabilization system. In lieu of needing to use a cumbersome tripod or other stabilization device, the kit's camera and telephoto lens are mounted on its special metal alloy rifle-type stock, which has an integrated trigger-activated shutter release and focusing mechanism. The stock is held firmly against the shoulder, the camera is aimed as a rifle or shotgun would be, and the trigger is pulled to take the photograph. Focusing is achieved by using a control knob located on the stock. No tripod, no set-up time, no adjusting for height... Sighting, focusing, and shooting all become natural, integrated movements. It's an extremely effective, yet simple, way to track and photograph a moving subject. In addition to surveillance applications, it's also ideal for photographing sporting events, wildlife photography, etc. The system's through-the-lens semi-automatic exposure meter and LED indicators in the viewfinder provide for optimum exposure settings, and an instant mirror-return enables continuous viewing of a subject before and after exposure. Its split-image focusing allows for excellent image sharpness under varying conditions, and its multi-coated achromatic lens provides for optimum light transmission and exceptional photographic imagery. Shutter speeds range from 1/30 second to 1/500 second. Uses standard 35mm film. 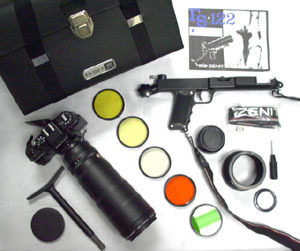 This is a complete system, which includes the 35mm camera and 300mm f/4.5 telephoto lens, detachable shoulder stock/pistol grip device, a 50mm f/2.0 Zenitar M2 lens, assorted optical glass filters, filter adapters, neckstrap, rubber eyecup and hood, tools, manual, and fitted carry case. Very limited quantity available.